Everyone's wondering how Lim Guan Eng managed to land himself with probably this century's sweetest property deal in Penang (maybe even in Malaysia) but as far as YB Tony Pua is concerned, his boss can beg, steal or borrow all he likes, the Penang CM couldn't do any wrong. Five years of flogging the 1MDB, Tony Pua is no closer to bringing down PM Najib Razak with his efforts. And that must be buggering him bad. It is also making him act idiotic and disingenuous. Take his latest antic, where he alleged that the 1MDB had no fund manager for Caymans. Pua had asked: "Is there an investment bank managing the funds in Cayman?" He did not ask, "Is there a fund manager managing the funds in Cayman?" The answer was NO, there is no investment bank managing the 1MDB funds in Cayman, simply because NOT ALL fund managers are investment banks. There is such a thing as a non-bank fund manager. Every investment company has fund managers. But these fund manageres, ladies and gentlemen, don't have to be investment bankers! But Pua, sadly, could not figure this out and accused 1MDB of not having fund managers in Cayman! This is just the latest trick of his that we've detected. At an event to celebrate DAP/Pakatan's win in Penang in 2008, Lim Guan Eng congratulated the party's top supporters on stage and most of them were from construction companies, much to the dismay of the more idealistic opposition and pro-opposition NGO activists. The DAP fancies itself as being the champion of meritocracy, transparency, accountability, integrity and so forth and looks towards Singapore as model, which is fine but when the likes of Tony Pua bark endlessly about issues such as 1MDB, the price Malaysia is paying for Littoral Combat Ships and the price and possible cost overruns of the MRT project, the thought crosses my mind as to how much the DAP-led state government of Penang has emulated the Singapore government statutory board, the Housing & Development Board (HDB) in providing, affordable, quality, professionally managed and maintained accommodation for ordinary Penangites on the island and mainland. For all its talk about being a party of "democratic socialism", the DAP is turning out to be a very much a bourgeois (capitalist) and petty-bourgeois (middle class) party indeed, with very little concern for the "small person". No the DAP is no longer "democratic socialist", if ever it was. Instead, it has become infested with neo-liberal ideology, with its leaders concerned about all this hi-falutin stuff which those with full belies can afford the luxury of time to indulge debate and arguments in but less so, those struggling to make ends meet. and I say this to you Dato, YOU should stop diverting the 1MDB issue as it is to huge and to big to be covered as compared to Guan Eng bunglow purchased. Well put Rocky Bru. The veneer of respectability (operative word being veneer) is fast beginning to peel all around the opposition. 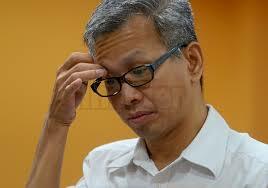 Tony Pua is not even comment worthy. But the points you raise are very valid and to the point. The PM's silence is as potent as Gandhi's in the face of British intimidation.Whatever one considers the PM to be and whatever our perceptions of him as being aloof, credit must be given to the man for his patience in the face of unrelenting abuse, insults, criminal allegations and defamation at unprecedented levels. Most leaders elsewhere faced with similar situations simply caved in and died (well metaphorically at least). He has not wavered and the opposition has not come up with one bit of admissible evidence to impeach the man. As for the Chinese, it is called good business when they land deals as Guan Eng has. But it is corruption in their lexicon when a Malay benefits or makes money or ends up with a good commercial deal. Thats mentality has to be kicked into the gutter where it belongs. Guan Eng needs to be harassed out of office as his mates have attempted to drive the PM out of office using the same methods used against the PM. Don't go into the technicals la...Non-bank fund manager means Jho Low and the gangs..